March has been a busy month for metalheads in Dallas-Fort Worth. 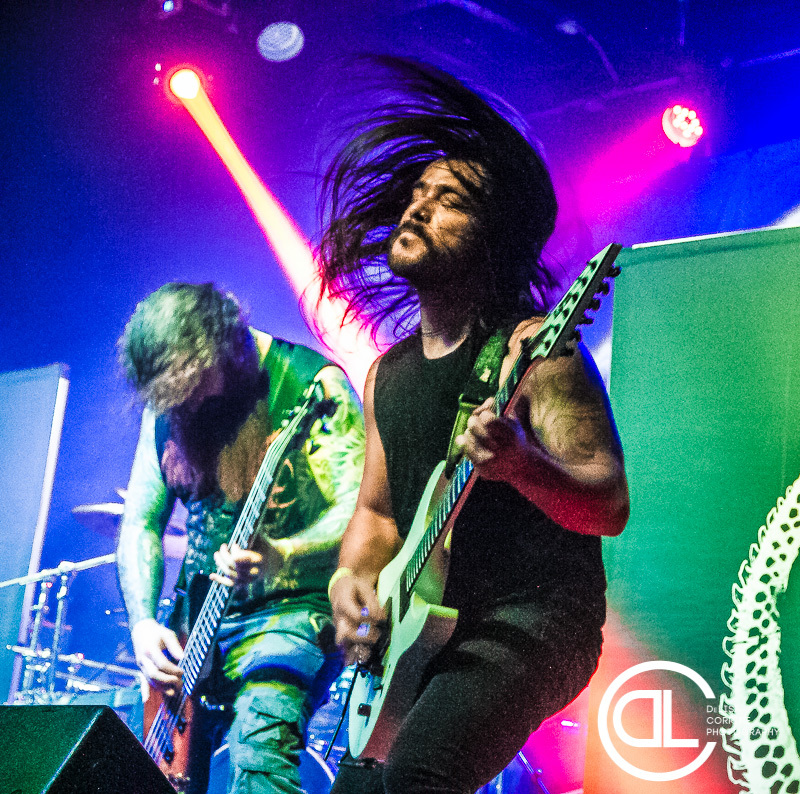 Last weekend, the Dallas Metal Scene hosted the Deep Ellum Metal Festival. This weekend, the Rail Club hosted the Fort Worth Metal Fest. In its fourth year, the festival offered nearly nine straight hours of metal. Whether you’re into thrash, death, grind, or black metal, there was something for everyone. Chemicaust went on around 3:00 and promptly blazed through their 30 minute set. There were only a couple of hundred people at the Rail Club, but those who were there were treated to a killer set. Playing tracks off their recently released Unleashed Upon This World (check out our review), the band thrashed their assess off. By the time Kaliya took the stage the crowd had easily doubled in size. The band tore through songs from last years split EP with Vaginal Bear Trap, Ripped Off, as well as songs from 2016’s MMXVI. The band played a brutal set that got the early crowd moving. Interment followed Kaliya’s set with their old school death metal that was nothing short of vicious. They easily have one of the biggest sounds of any three-piece metal act in the area. Ominous, menacing, and unrepentant, the band slugged their way through 30 minutes of eardrum punishing metal. Demonseed put on a high energy set that incited a pit so ferocious that bones were actually broken. The band played like they had something to prove to both the crowd and themselves. Playing tracks from their Human Disposal Syndicate LP, the band was razor sharp and merciless. Dark Funeral. Photo by DeLisa McMurray. Creating chaos in the form of progressive metal, Seeker was one of many highlights of the night. Dynamic and abrasive, the band seemed to be especially motivated to stand out among the nine other bands playing the festival. Mission accomplished. The band was on fire and left the crowd wanting more. The cerebral and theatrical Thy Antichrist punished the audience with a set that no one will soon forget. The crowd was high on the energy the band brought to the stage and likewise, the band used the crowd to fuel their set. The temperature inside the Rail Club seemed to increase during their performance and the band never hesitated in keeping the energy at a maximum. San Diego’s Cattle Decapitation did what they do best: destroyed everyone in their wake. The band is among the most reliable in the metal world when it comes to live performance. Their set drew largely from 2015’s The Anthropocene Extinction, but they also sprinkled in other songs from their discography. The band kept the crowd moving as multiple pits opened up and some fans even fled the scene for fear of their own safety. About half way through their set, vocalist Travis Ryan gave a shout-out to Warbeast singer Bruce Corbitt that not only cemented the crowds approval, but seemed to ignite the rest of their show. Swedish black metal legends Dark Funeral were utterly diabolical. Mostly playing material from 2016’s Where Shadows Forever Reign, the band played at least one song from each of their six albums, including a number of deep cuts. While Lord Ahriman is the only remaining founding member of the band, collectively they played as a tight unit capable of predicting each others next move. Guitars roared and drums walloped as the band flawlessly executed each song. They were a treat for those who had already endured nearly seven hours of metal. Adding to the international flare of the metal festival, Septicflesh, from Athens, Greece, closed the evening in memorable form. Given that many in the crowd had arrived at the Rail Club before 3:00pm, you wouldn’t have blamed anyone for being slightly exhausted. While the crowd had somewhat thinned, the club was still packed to the gills for the Greek death metal titans. Playing 12 songs across their last four albums, the band played an inspired set. Having been on tour with Thy Antichrist and Dark Funeral since mid-February, the band had obviously honed their set over the last 20-some-odd dates. They were powerful and confident and played with an unflagging conviction. It should go without saying that the Fort Worth Metal Fest was a huge success. While it has been shortened from two days down to one, no one was shortchanged on great performances. The Rail Club bartenders and staff may have had their hands full, but everything ran smoothly, sometimes even ahead of schedule. We’re looking forward to more additions to this annual event. Cattle Decapitation. Photo by DeLisa McMurray. Demonseed. Photo by DeLisa McMurray. Interment. Photo by DeLisa McMurray. Kaliya. Photo by DeLisa McMurray. Pit. Photo by DeLisa McMurray. Seeker. Photo by DeLisa McMurray. Septicflesh. Photo by DeLisa McMurray. Thy Antichrist. Photo by DeLisa McMurray.